So . . . . . I’m on a kick to try to lose weight. ???? I blame my husband, really. He has been working out like a mad man. I mean, like up early early early in the morning to go for a run, biking to work, and then going for another bike ride too. It’s bananas. But, at the risk of grossing out my children reading this at some point in the future, just harmlessly looking for their mom’s potato salad recipe . . . He even got hit on by a girl who looked like she was young enough to be our daughter. I actually almost told her how embarrassed she should be. Trying to lose weight in summer isn’t fun. I mean, it’s never fun. But in summer you are drinking big pitchers of sangria and eating all of the taco pasta salad you can get your little hands on. The struggle has never been more real. So. 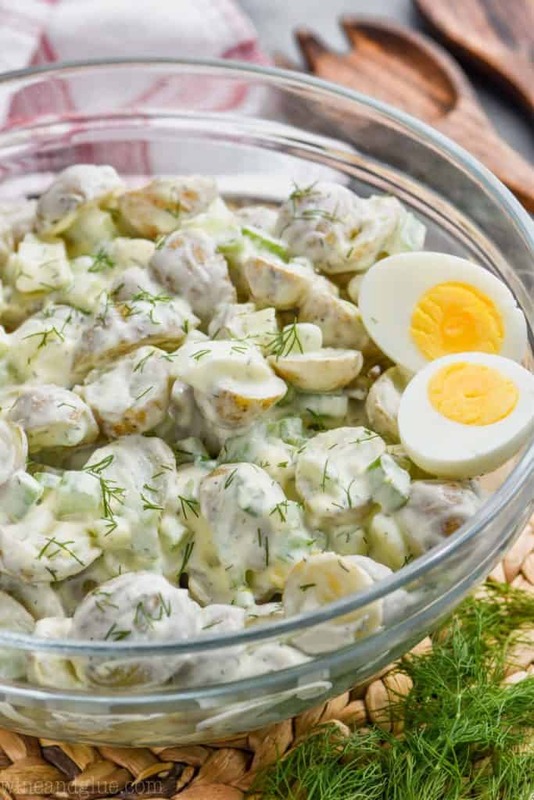 I’m here today with a healthy potato salad recipe. I know. I’m even rolling my eyes at myself. 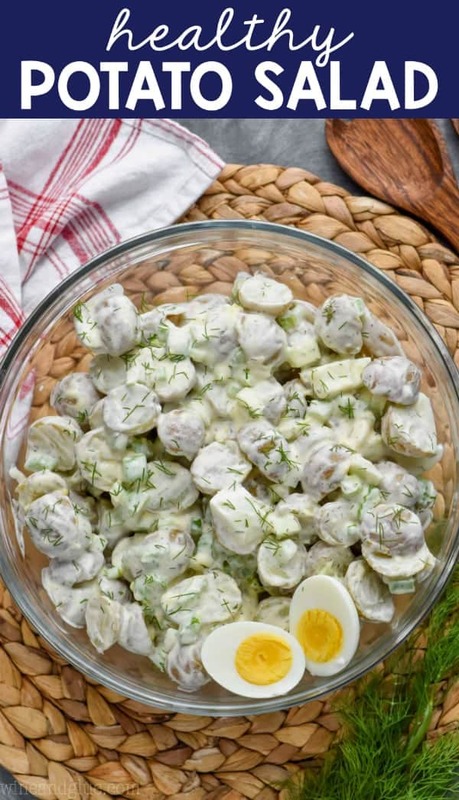 But to be fair, it’s really really good, and it is lighter than your typical potato salad. 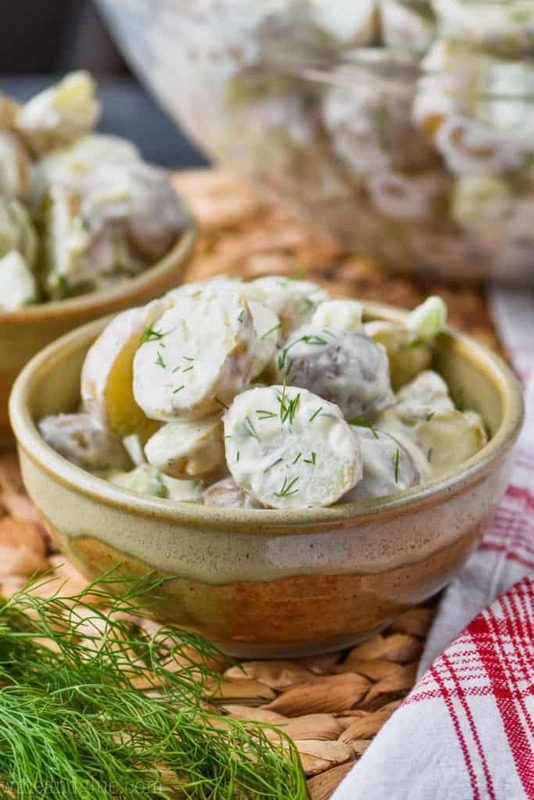 WHAT’S IN THIS HEALTHY POTATO SALAD RECIPE? 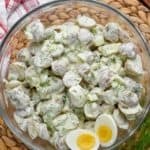 Creamer Potatoes – small little potatoes that work perfectly in this salad. Light Mayonnaise – anyone else think of Joey from Friends when they hear light mayo? No? Just me then. It’s such a simple recipe, but swapping out all the mayonnaise for some light mayo and some non fat yogurt cut out a lot of the calories. And you won’t even miss them. The seasonings in this and the creaminess of the potatoes make up for it. If you wanted to cut the calories even more, you could hard boil one more egg and remove the yolks from the eggs before throwing them in in the salad, just using the egg whites. As I said, eating light in the summer is HARD. Especially with all the fun BBQs and picnics that you get invited to. 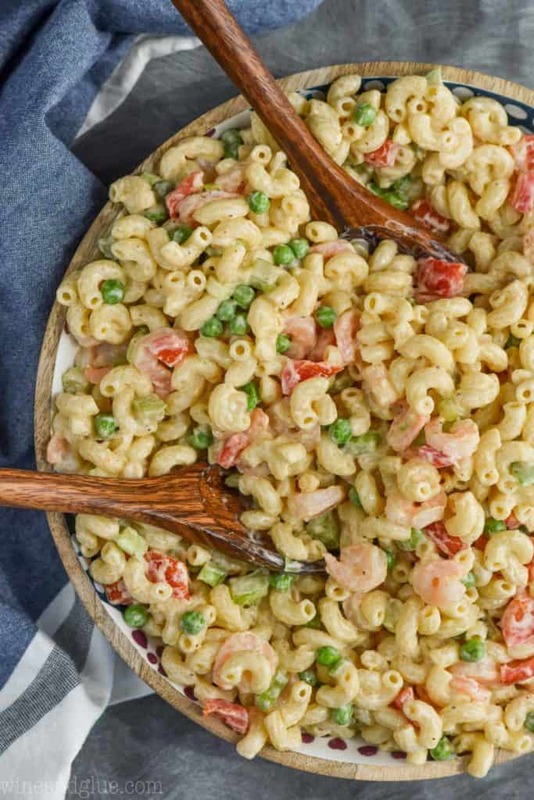 Here are some additional recipes that are perfect to bring to potlucks so you know there are some healthy recipes available. This Easy Beet Salad is only THREE ingredients. 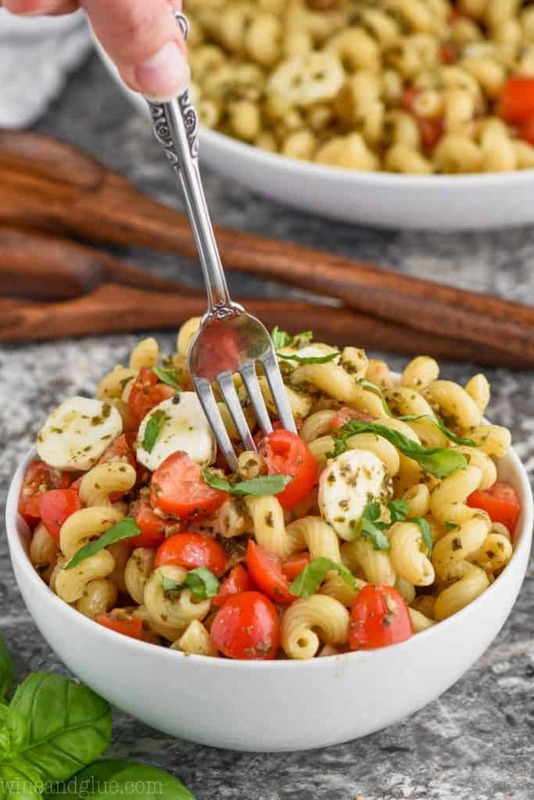 Its satisfying but also a dish you can feel good about! This Sunflower Chicken Salad is not only packed with healthy goodness, it’s also done in 15 minutes! If you haven’t jumped on the healthy quinoa train yet, do it with this Greek Quinoa Chicken Salad! And this Parmesan Crusted Zucchini and Yellow Squash is the perfect side dish! Cook the potatoes by boiling them in water and cooking until just fork tender. Keep an eye on them because you don't want them to over cook. Mine took about 15 minutes total. 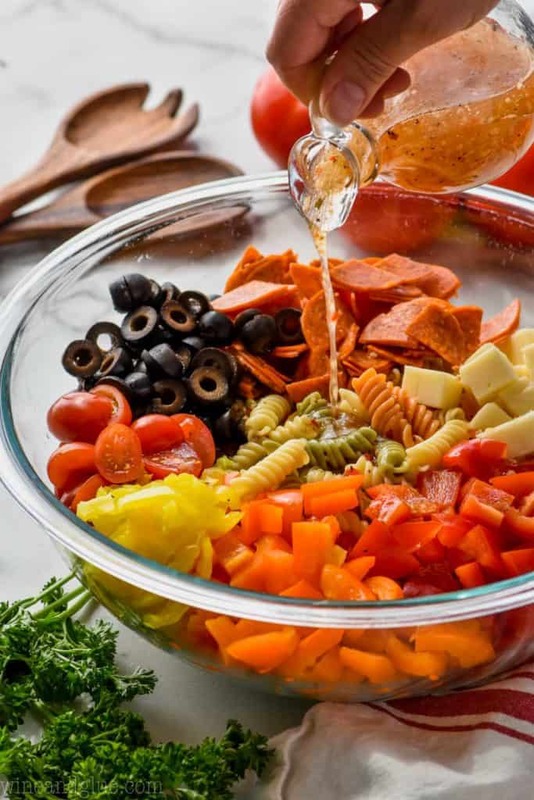 While the potatoes are cooking, dice your vegetables and mix together the dressing whisking until fully combined. 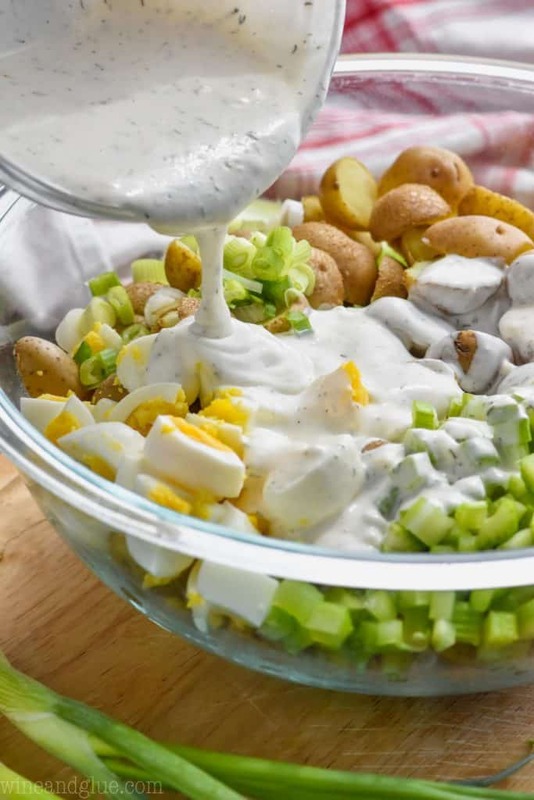 After the potatoes are finished cooking, allow to cool about 10 minutes, and then in a large bowl, mix together the potatoes, scallions, celery, and hard boiled eggs. Toss with the dressing. 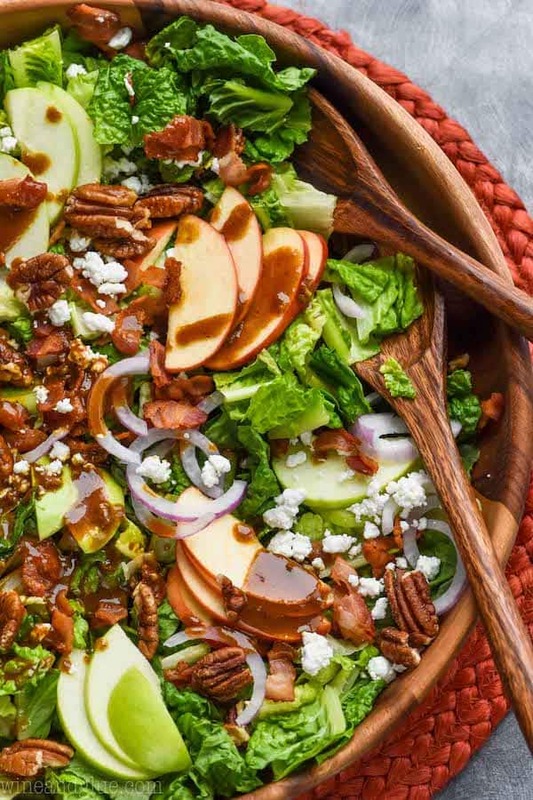 This salad gets better as the dressing soaks into the potatoes. Make up to 24 hours in advance and store in the refrigerator up to two days. If you would like to cut the calories even more, add an additional hard boiled egg, but discard the yolks. Substitute steamed Cauliflower for the potatoes, add a dab of mustard and enjoy! HAHA!! I love that he got hit on by a “youngster” lol!!! That just happened to me last night. My husband and I were at a show and this kid started talking to me while Eric was in the bathroom. He’s like, do you go to Sac state? I’m like NOOOOOPE. lol!!! 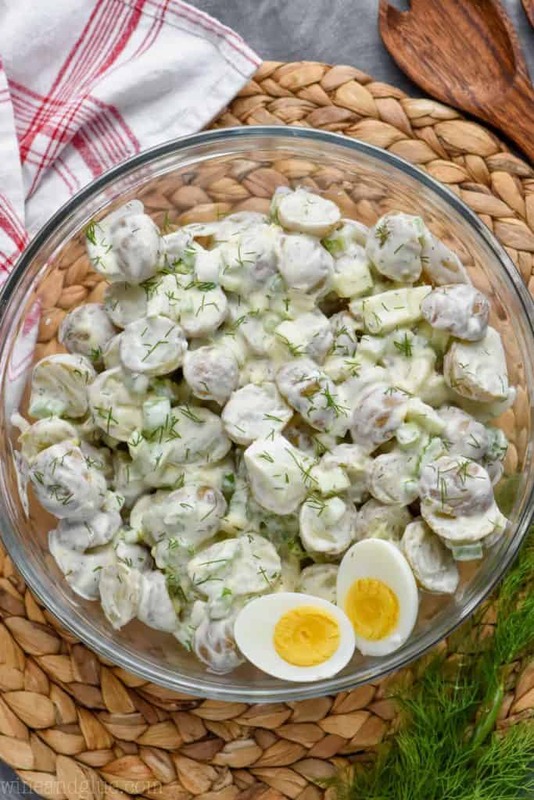 This potato salad looks killer!! Gimme alll the healthy recipes.